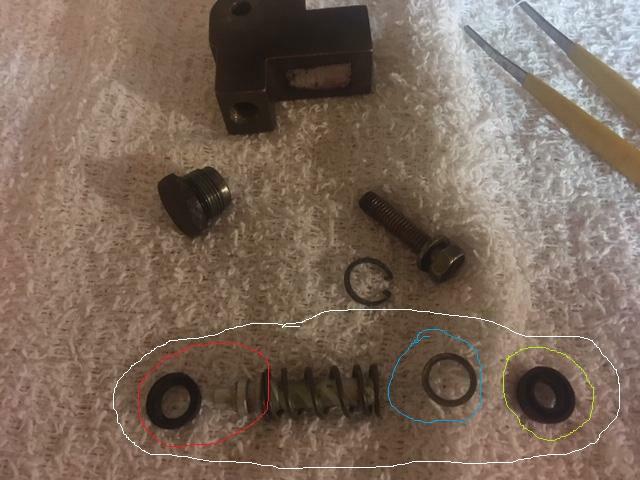 I want to make sure I reassemble the proportioning valve in the rear of the car correctly. I know that it is actually more of a delay valve, but known as a proportioning valve. My question is which direction does the inner (red) seal go and on the other end what is the order of the washer (blue) and seal and direction of the seal (green). Thanks for the help. I just did this last month but damned if I can remember, @Namerow will know. 1) Hex plug. 2) Seal with flat side out and U cupped shape in. 3) smaller washer. 4) snap ring. 5) larger washer. 6) spring. 7) shaft (see photo for orientation). 8 ) Seal with flat side in and U cup shape pointing toward the hex plug/out. Essentially the U / cupped shape of the seals both point toward the center. 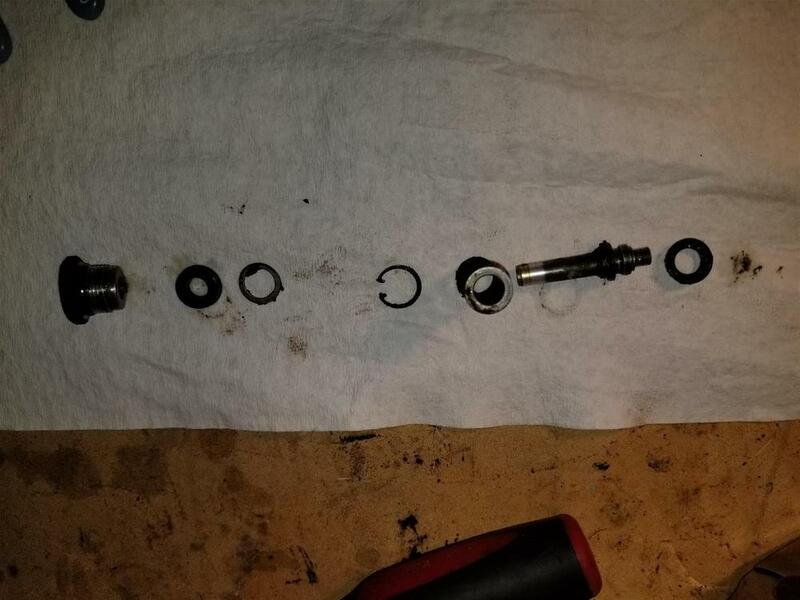 I used a 5/16 socket to push the assembly down and cause the snap ring to re-seat when I reassembled. I used the MSA seal kit but really I think the original seals were just fine. Mostly what I accomplished was cleaning out 45 years of gunk. I wish I could but 1) the valve is reassembled and installed in the car and 2) I am on an extended trip and am away from my car/garage/parts. Here is another photo with the larger washer sitting on the spring. 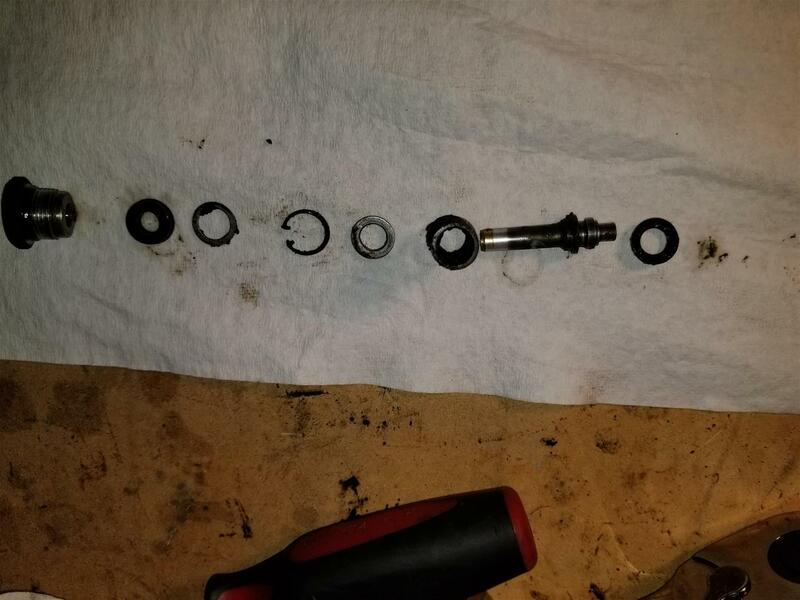 Looks like it is about the same diameter as the spring. Its primary purpose seems to be to give the snap ring a solid surface before the spring. Can't help with this one. I was involved in some commentary about techniques for seating the snap ring, but that's about it. JR's disassembly photos look pretty definitive, so I expect that that part of the mystery has been solved for you. The missing washer looks pretty generic, provided that you can find one with approx. the right OD and ID. Alternatively, @zKars might have a complete valve assy to offer from his used parts stash.